Get Gunite Pool Leak Detection and Pool Leak Repair done right the first time with Texas Fiberglass Pools Inc.. We truly believes that every pool owner, commercial or residential, has the right to an exquisite-looking swimming pool or hot tub, made with quality materials. We have over 20 years of experience fixing and resurfacing pools for our Texas and surrounding states of Oklahoma, Louisiana, New Mexico, Arkansas and Nebraska area customers. Happiness and relaxation should result from beautiful pools and to ensure that, regular Pool System Repair and Pool Maintenance is required. Sun damage and wear and tear make some repairs inevitable, but there are many other problems that could spring up and ruin your pool. Take note that if someone provides you a Swimming Pool Leak Repair quote to fix a pool crack with staples, epoxy injection and/or plaster over it – expect to repair it again in 6 to 12 months. 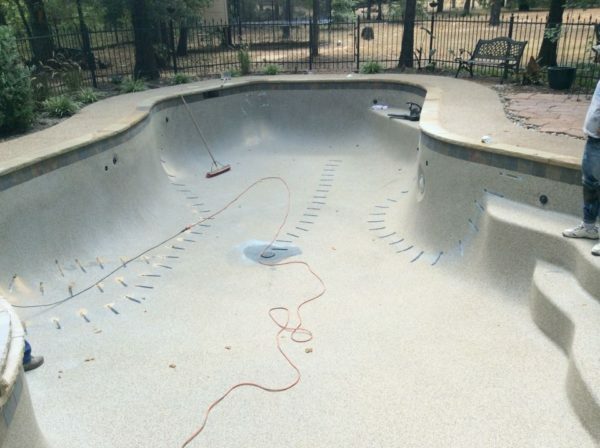 The proper way to fix a pool crack is by using stainless steel staples, which do now rust over time, and are covered with epoxy; but, the most important aspect is what is laid over it, which should be fiberglass. Also, consider that stainless steel staples work best when you use it with something flexible such as fiberglass. When using staples with fiberglass, you have 20% to 30% more flexibility on your pool’s surface. With plaster, concrete, or other pool surfaces, you will have 0% flexibility which can cause problems down the road. Our goal is always complete customer satisfaction. We have references and testimonials and offer the longest warranty in the industry! Our Texas Fiberglass Pools Inc. pool repair professionals have years of professional expertise. We guarantee no Pool Repair, waterfall installment, or patio job is beyond our ability! We have yet to meet a pool repair, pool renovation or pool upgrade we couldn’t handle. Texas Fiberglass Pools Inc.’ technicians excel in providing outstanding service for any problem or task. Our experts understand problems with cracks in gunite pools and can identify solutions and carry the right products to keep your pool running properly and looking spectacular. There are different types of materials people use to line modern day pools, but we can assure you that fiberglass is the most durable, affordable, and easiest to install and maintain. People assume concrete with a plaster liner is enough; but they stress and crack over time as they expand and contrast with the seasons. You might need to resurface a pool about every 3 years, but fiberglass pools maintain their shape in any condition, and they require much less maintenance that lasts decades without ever needing a full pool resurfacing! We offer a variety of colors for your fiberglass surface: white, light blue, blue, medium blue, and blue-green. Our fiberglass surfaces will bring sparkle and splendor to you homestead or commercial business for generations. Feel the comfort of knowing that your Gunite Pool Crack Repair done by Texas Fiberglass Pools Inc. comes with a limited 5 year warranty. Preparation is the most important thing. Customers in the past that have used silicon, epoxy, pool putty, and even tape to try to stop the leaks have found out that the cheapest way is not the right way. If you want your Pool Crack Repair done the professional way, contact your friends at Texas Fiberglass Pools Inc. Fill out our short form to get immediate help with your Gunite Pool Leak Repair issue.